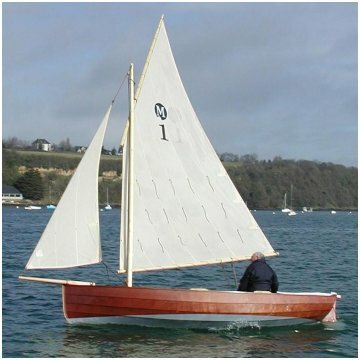 You will find on this page my "sail and oar" designs for amateur builders. Most of them may also be purchased "ready to sail" from authorised builders. A general introduction to the sail and oars concept is to be found on this page. See page "classic and traditional sail boats" for other small boats designs where sail is the main propulsion mean. I am progressively translating my building plans into English. If a plan is not said "available", please ask for a delivery date. My translation schedule will be adapted to demand. La�ta is inspired by the Scandinavian "prams", which were well-known all around the world at the beginning of the 20th century, as tenders of ships, and later as small pleasure crafts, due to their excellent nautical properties. Having very similar behaviour and performance to a modern sailing dinghy, it offers in addition the possibility to lower the mast and row when the wind is missing. The "pram" shape provides good and safe sea-keeping ability. The sail may be reefed down if the wind get stronger . This makes La�ta an ideal boat for youths and children. On choppy sea, it shakes, wets, but it keeps going. The normal crew is one or two adults; it can be three children as well. Being light, about 75 kg, La�ta can be moved by two people and carried on top of a car. Laita is very easy to build. 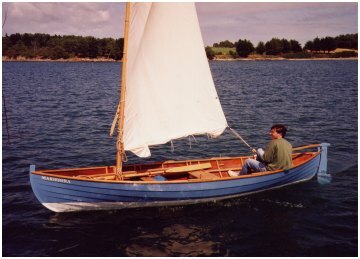 It is clinker built, with 6 mm plywood for the hull. It is a great way of practising for the home builder before considering more sophisticated and larger projects. That is why, Les Gl�nans, the famous French sailing school, and the team "Fr�re de Mer" have adopted La�ta as an educational project for the young people of French cities. About fifty La�ta have been built in this context. In the Nederland, ready to sail boat or kit is marketed by de Bootbouwer. Builders in other countries are welcome. A dinghy, able to take 1 to 3 crew, with a performing balanced lug, as the International 12 feet which has been an Olympic class. A "sail and oar" boat, able to sail anywhere. 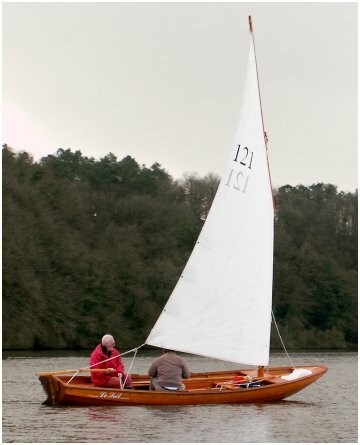 The moderate size makes Morbic 12 an ideal boat for frequent single handling but she is able to take a crew of 3 and is fitted with 2 rowing thwarts. And also a simple motor boat, with its generous transom width. A cut-out in transom allows to fit a short-shaft outboard motor. 2 rig options : standing lug (picture) or sloop lug (with a jib). And all that keeping the lovely looking of a classic boat. The very detailed plan is available from te designer in French. Translation into English will be done on demand. Icarai proposes a complete kit including all plywood parts cut on NC machines, most of which not requiring any adjustment. Ready to sail boat is also available. Kits (in particular set of NC cut plywood), as well as finished boats, are also availble from Clint Chase Boat Builder in the USA. Ask them for quotations. Morbic 12, ready to sail, is built by Adrian Donovan boatbuilder in UK. Morbic 12, ready to sail, is built by Ben Ullings in the Nederland. Aber was the first boat created in 1985 as a result of the desire to provide a boat especially designed for the home builder. It is derived from Aven, my first sail & oars design. It is a little smaller, but has more buoyancy in the fore sections for better sea keeping. Aber kept the simple but so efficient lug rig in the Breton style, with a well peaked yard. It has a pivoting centerboard. The rudder is fixed but can slide vertically. 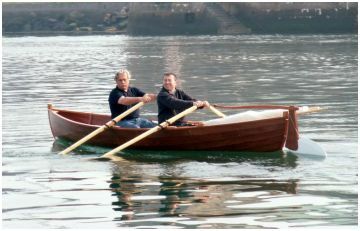 Due to its moderate size, Aber is an excellent rowing boat for one or two persons. It is also a very lively and fast sailboat. In the sail & oars range, Aber is the best choice for small crew, from 1 to 3. As a result of these qualities, Aber was classified in the "top 150" by the English magazine "Classic Boat" (issue 150). Aber is strip planked over bent or laminated frames. 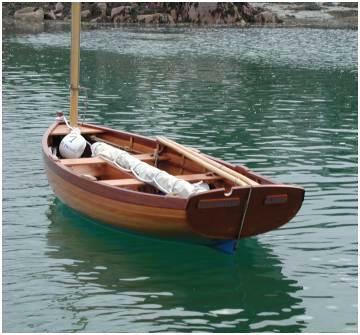 Since 2004, there is a plywood (6 mm) clinker version which gives a lighter boat. Aber is built by Icarai. Icarai proposes a complete kit of the clinker version including all plywood parts cut on NC machines, most of which not requiring any adjustment. 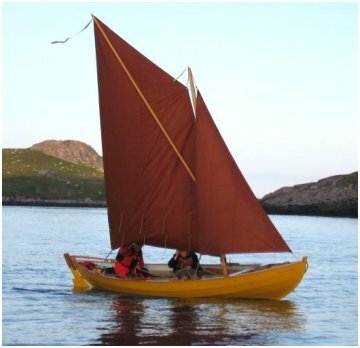 Ilur was designed after Aber, in order to get a larger boat, able to family day sailing. She can be used for fishing and even coastal cruising. Two Ilur have been to Ile of Sein, at the extreme West of France, one of the worst place to go with tremendous tides and the worst sea conditions. However, do not consider this as an invitation to go there! Length was increased by 20 cm only, but Ilur is mostly wider and higher, with a generous freeboard. This makes a very different boat, with good seakeeping ability, but still in the "sail and oar" spirit. Its superior quality makes Ilur my best-seller plan (with nearly one thousand copies sold). It has been built in many places, from the very heart of Alps, to Pacific islands! 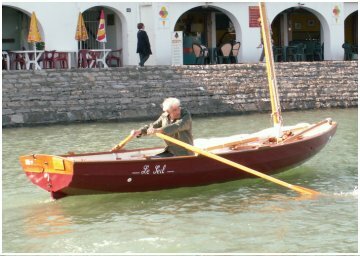 If you have to choose the best boat for your intended use, just notice than Ilur is not as an easygoing rowing boat compared to others of my sail and oar designs. She is mainly intended for sail, oars being used when wind is falling or to reach some narrow inlets. However, the clinker version is lighter and rows well. The dagger-board was initially preferred in order to give room for crew. It is now replaced by a pivoting centerboard and a low centerboard case which is not at all cumbersome. Many other improvements are continuously brought. As an example oars may be stowed under floorboard, leaving a free cockpit when sailing. 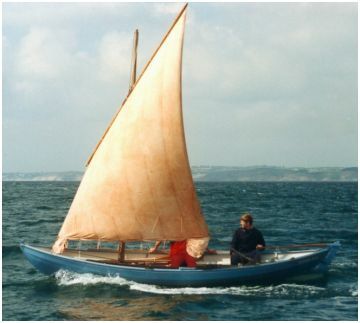 Ilur was designed at first with the simple lug sail in the Breton style (said "misainier" rig). A lug sloop rig is now proposed and is a valuable option. A balanced lug rig (lug sail with boom) is an other option, interestiong for river or single-handed sailing. Construction is either strip planked or plywood clinker. In both cases, laminated or steam bent frames give a very traditional and beautiful looking. However, very detailed plans and instruction booklet allow construction by any home builder. Full size patterns may be purchased in addition to the building plan to make construction easier. A timber clinker version is also available on demand. Ilur (clinker version only) may also be built from a NC cut plywood kit. This kit has been completely redesigned in 2011 in order to reduce dramatically the building time and have it easier to make for the first time home boat-builder. Frames are replaced by NC cut plywood transverse bulkheads. Attention: the building plan (also said plan package) is specific to this new Ilur. The kit itself is to be ordered from one of the seller listed here-under. Icarai boatyard is selling kits for both versions, as well as ready to sail boats. The kit is also availble in the Nederland from de Bootbouwer. Ilur, ready to sail, is built by Ben Ullings in the Nederland. Minahouet, which was first built at the end of 2002. She the synthesis of my previous designs, particularly Aber and Ilur, taking the best of all of them. I wanted to draw a sail and oar boat as balanced as possible: enough carrying capacity for sailing with family, lightweight and moderate breadth for the pleasure of rowing. New arrangements improve the comfort of use: lowered centerboard case which ease movements of crew, stowage of oars under the thwarts, enclosed lockers. 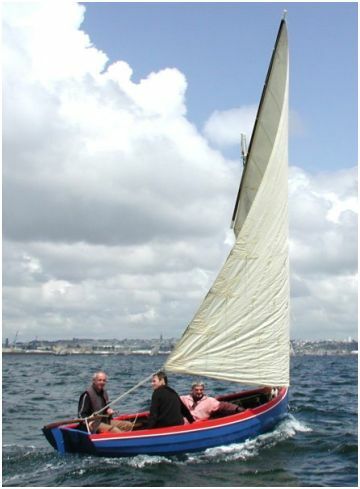 Two rig versions have been anticipated: the traditional and simple lug sail (misainier in Brittany) on one hand, the lug sail sloop (picture) on the other. In the latter case, it is possible to step the mast forward and sail without jib, which is an ideal setting when single handed. Minahouet was designed to be very easily built by home builders through a kit based on plywood cut on numerically controlled cutting machines. Dovetailing moulds allow you to erect a building gig with high precision from the first day. Nearly all plywood parts, including lapstrake boards (9 mm plywood), are delivered at the final dimensions and require no adjustment. Forget the doubts and questions about proper lofting and bevels! Kit or ready to sail Minahouet are proposed by Grand-Largue boatbuilder. Elorn is designed to favour the pleasure of rowing at sea. Within all my sail and oar boats, she is the best for easy rowing, with one or two rowers. She is inspired from both Norwegian faerings and american peapods. From the last, she kept the symetrical double-ended hull forms, allowing to row both directions : according to crew number, it is always possible to row with the boat in perfect trim condition. Eye type oars, inspired from Irish curraghs and improved year after year, result in an effortless rowing. Elorn is able to make long passages at a speed of 4 knots. 4 rig options are possible, with lug of spritsail (picture), with or without jib. See drawings. A daggerboard allows good windward performance. Elorn is clinker planked with 6 mm marine plywood and is light to handle. She is seaworthy and quite dry in open water. Elorn may also be built as rowing boat only, without rig, rudder and centreboard. Icarai boatyard is selling kits as well as ready to sail Elorn. 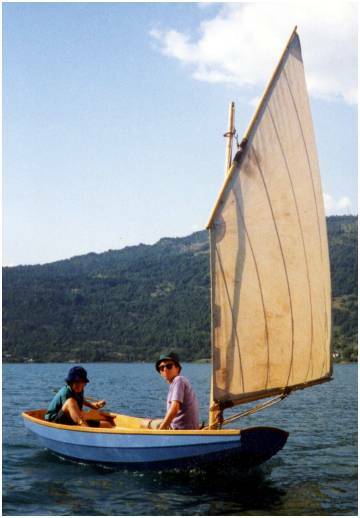 Seil is a large pram designed initially for a group of yachtsmen from Nantes area, eager to have a sail and oar boat suited to navigation on the Loire, and rivers in general. Seil is in fact the name of a backwater, now filled up, of the Loire river. A pram is a boat of Scandinavian origin, characterized by a clinker construction and especially by a small fore transom. The fore rocking facilitates embarking on the strand. The full fore and aft hull lines make Seil a very seaworthy and stable boat. This shape of hull obstructs a little in a choppy sea but it is ultimately a boat as well adapted to the sea as with sheltered water. Of moderated width, Seil is easily pulled under oars and is a very good compromise between sail and oars abilities. Seil has the capacity to take on board a numerous crew (up to 6), which makes it a boat well adapted to the family or collective uses: sailing schools, youth organisations or other associations. It is rigged with a high aspect standing lug sail. When tacking, you just have to pass the sheet from one side to the other. The crew can lower the mast, for example to get under a bridge. Seil is provided with two rowing thwarts. With a crew of young people or children, it is possible to row with two oarsmen per thwart. Seil has been produced in grp by "Canotage de France", a boat-builder which is now out of business. In fact grp Seils are largely dominants today, thanks to the large efforts of Fran�ois Leli�vre (Canotage de France) who made Seil being the "sail and oar boat" having the most dynamic owner association. Seil was thus victorious in 2004 of the raid "Sail Caledonia" in Scotland. Seil is particularly easy to build in its wooden version, which has also the advantage of a greater lightness. Indeed, the planks (9 mm plywood) are very few and do not have any twist. They naturally take place on a building frame made up in particular of transverse bulkheads and both transoms. Seil 18 is the last version, including many improvements : side seats to accommodate a large crew, ability to raise the floorboards on the rowing thwarts allowing to spend a night under a tent, aft locker able to stow a small outboard motor. She is proposed for home-builders with an very detailed building handbook to put its realization at the range of any a little persevering home builder. You may find very beneficial to supplement it with the choice of full-scale patterns drawn on polyester film of the bulkheads, transoms, planks, rudder, etc, to order to the architect. A home builder in Australia, Rien Hofman, has a blog on the Seil construction. A professional wooden construction is made by French boatbuilder Icarai and by Ben Ullings in the Netherlands. For other countries, please contact the architect. See article in issue 47 of Watercraft magazine. Icarai boatyard is selling kits as well as ready to sail Seil 18. Seil 18, ready to sail, is built by Ben Ullings in the Nederland. I have tried successively the sprit-sail sloop rig and the dipping lug, and when I sold the boat, the standing lug sail. I like much the sprit-sail, unrecognized and typical of many Northern Europe boats. But after the first years, I have fitted the dipping lug sail (picture). It is a demanding rig. You have to gybe (pass the yard from one side to the other), which can be done within seconds with practice. But it is the best performing traditional rig, due to sail always well apart from the mast. Whether sailing or rowing, Youkou-Lili had always the first place in the sail and oars contests it participated. The plans of the boat are now offered for sale, and the name of my ship became the name of the series. One of them won the "Great Glenn Raid" in its category in Scotland, which proves the quality of the boat. In 2004 I have updated all drawings, incorporating many improvements and to make construction easier. Full-scale polyester patterns are also available. Besides existing one, I propose a new sail plan, consisting of lug sail and jib, very suitable for this long hull. Kit, as well as ready-to-sail boats are marketed by Icarai, my son's company, who has spent a lot of time sailing with me on Youkou-Lili.